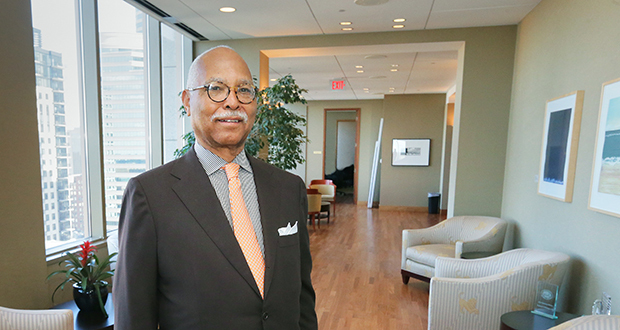 Long ago and far away, Cornell Leverette Moore first undertook his real-world studies into the proprieties of dressing for business and personal success. “I’m from the South (the Deep South, and that’s when the Deep South really meant something), and I guess dressing up is just more of a thing in the South,” he says. That’s how he remembers it: white shirt, tie, de rigueur as daily wear for the (male, presumably) doctors and lawyers in town. That’s how it was when he was growing up in Statesboro, Georgia, in the 1940s and ’50s. When he reached an employable age, Moore worked in both men’s and women’s clothing stores before heading off to college: first for undergrad studies at Virginia Union University in Richmond, then on to Howard University in Washington, D.C., for the law degree that launched him on his path to legal and business success in Minneapolis. He’s always dressed the part, from his time as a fledgling banker with the U.S. Treasury Department, Crocker Citizens National Bank, San Francisco and Northwestern National Bank of Minneapolis et al. to his position today as partner of long-standing with the Minneapolis law firm of Dorsey & Whitney LLP. At first, “you have to fake it until you make it,” he says (with a chuckle) of his early-years adoption of the rules of formal business attire. Once he established his career and business bona fides, Moore continued to develop his sartorial style as well. As he learned, it never hurts to be one of the best-dressed men in the room when it comes to impressing clients. Clients who see a lawyer dressed lackadaisically may wonder if he or she is less than meticulous about keeping client files organized and up to date, or how meticulous that person is in preparing for court or the board meeting, Moore says. Human nature, that’s all it is, yet Moore never wanted to leave any room for doubt in clients’ minds as to his purpose in representing them to the best of his abilities. And then there’s the awkward issue of race; one that Moore, as an African American man pursuing a career in white-collar America in the 1960s, faced down with a show of sartorial splendor. “I never wanted to be mistaken for the help,” he explains. Let’s make that Moore’s Rule for Sartorial Success No. 3, still standing today with the proviso that it’s an applicable piece of career advice to people of any race, creed, gender or socio-economic class of origin (you have to achieve the right to dress down in the executive office today, a la the tony t-shirt and blue jeans look of Silicon Valley). Moore acknowledges that his interest in men’s clothing may be slightly out of sync with the current fashion zeitgeist. Business-casual backsliders abound. Even the schools have abandoned the fight. Young men were required to dress in jacket and tie three days a week at Virginia Union University during Moore’s undergraduate days in the 1950s. “They’ve stopped doing that,” he says, with a disbelieving shake of the head. The same emphasis on dressing for the respect of the profession prevailed at Howard University Law School, where Moore earned his law degree in 1964. He also worked at the U.S. Treasury Department in Washington, D.C., during his Howard days, preparing himself for a career in banking and finance that ultimately led him to a job as regional counsel for the Office of Comptroller of the Currency, the national bank examiner based in Minneapolis. He and his wife have lived in Minneapolis for over 50 years, a tribute to their hardy personal selves and perhaps to Moore’s having discovered the unrivalled benefits of woolen and cashmere winter wear. Moore owns — or did own, until his relatively recent decision to downsize his personal sartorial holdings — hundreds of finely cut men’s suits. But closet space comes dear for such a collection, especially in the condo that Moore and his wife live in now. In two previous homes, Moore specified room designs for his ever-expanding arrays of suits, sport coats, shirts, ties, shoes and cufflinks. “I had slots for the shirts,” he notes, as would be seen in a fine men’s clothing department. 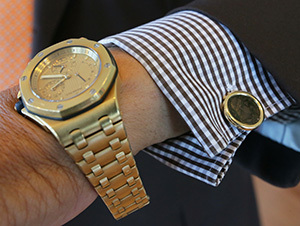 Moore keeps a close eye on the world of ritzy wristwatches. The one anchoring his left arm for a recent news interview looked to be worth its weight in gold. It’s actually worth considerably more than the straight-out value of its gold content: it’s a Royal Oak offshore gold watch, hefty enough to use for modest power-lifting, hand-crafted by Audemars Piguet, a 140-year-old Swiss luxury watchmaker. The watch inspired Moore to contact the company, to see about making a trip to the source. The company acceded to his request, and on the appointed day, Moore emerged from his Geneva hotel at 8:30 a.m. — precisely at 8:30 a.m., timeliness being all in dealing with Swiss watchmakers — to enter a company-provided limousine. Swept up in a grand adventure, Moore settled in for an hour-long ride into the surrounding hillside. “I felt like I was in a James Bond movie,” Moore says. The driver spoke little English, depriving Moore of any opportunity to learn exactly where he was going. Once at the factory, he was informed, “No cameras or recording devices, please,” then ushered into the inner sanctum of Swiss watchmaking. He met the maker of his watch, a man who tipped open the watch case to reveal a tiny squiggle of lines that indicated the watchmaker’s personal mark. The craftsman actually cried to see his creation returned for a visit, Moore says. The watch remains the crown jewel of Moore’s collection of prize watches. As to dress wear, Moore favors the Italians, specifically Kiton. “The Bentley of men’s clothing,” he says. He sources his suits, shirts and other accoutrements from a variety of well-known (to him) sources, including local favorite Hubert White in Minneapolis — and an online store that operates out of the Colorado backcountry. As fortune would have it, the owner of the online outlet purchases and resells “new old stock” from an old-line Dallas clothing store. Much as Moore attempts to tamp down his clothing purchases, he still can’t resist a good deal on a great shirt. The one he wore for our interview came from the online outlet, by way of an old-line Dallas clothier, Stanley S. Korshak, bearing the Kiton label. Originally priced at $800, Moore got it for a lot less (it had to be altered to fit, but that’s just part of the game). He had the receipt in hand as proof. And there’s Moore’s Law for Sartorial Success No. 4, summed up by the inveterate shopper’s perennial rallying cry: Never pay retail! “Did he show you the receipt?” asked Paige Will, a salesman/buyer at Hubert White who’s known — and sold clothing to — Moore for more than 30 years, when this reporter squealed about Moore’s recent purchase of a Kiton shirt, despite his avowed best intention to downsize, downsize, downsize. So much so that one of Moore’s daughters accosted Will at a wedding celebration some years back, accusing him — in all good humor — of aiding and abetting her father in the squandering of her inheritance. When Dorsey went to a Friday-casual dress code years ago, an alarmed Moore enlisted Will’s services in setting up photo shoots to illustrate what type of business-casual was acceptable within the Dorsey culture. Moore himself posed for the men’s business-casual photos, Will says. Dorsey sent the photos to all its offices, domestic and international, Will says. 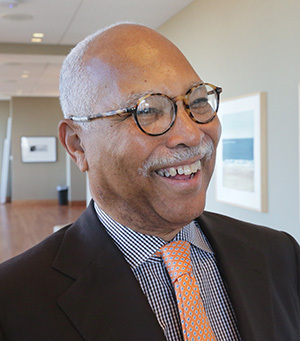 As to his peers in the legal community, Moore serves as a model for decorous dress. “He’s a stylish guy, very caring about what other people perceive him to be,” says Steve Meshbesher, of Meshbesher & Associates in Minneapolis. “He is very aware of his surroundings, socially, politically, legally. Moore agreed to inventory the contents for us. The only surprise was that there were no real surprises in his report. No seventh-game ticket stubs from the 1987 World Series to remind Moore of his days as a silent, but enthusiastic, minority owner of the World Champion Minnesota Twins baseball club; no smoking guns; no long-lost shoes, gloves, hats or ice scrapers; no scary rabbits. Not this day, but on occasion he packs a lunch or takes some leftovers to work. Enjoyed reading about you. I really enjoyed meeting you and I share all of your ideas. I too believe that it is important to make clothing an important part of who you are. I am going to have to decrease my wardrobe because there are no closets big enough for my shoes and my accessories, much less my dresses etc. I finally got rid of my suits, but that was long after I retired. I hope that you have many more years to have fun and enjoy life! Just got done watching your 1977 “July Magazine” interview on Youtube and wanted to learn more about your success. Congratulations for being rewarded for your years of hard work!